Time for the sea: the future of Tropico - on the coast! Curb the limitless potential of the sea, flooding the floating structures all the space around your island. Build in the sea completely new buildings designed for protection, food production and energy production, as well as entertainment and even residential complexes that have both their own advantages and disadvantages. Organize and coordinate transport communications with floating facilities such as oyster and seaweed farms, build tidal power plants as an environmentally friendly alternative to nuclear energy, create stunning floating apartments if your island runs out of space. Launch military submarines to support your fleet or create an exotic bathysphere to attract tourists! 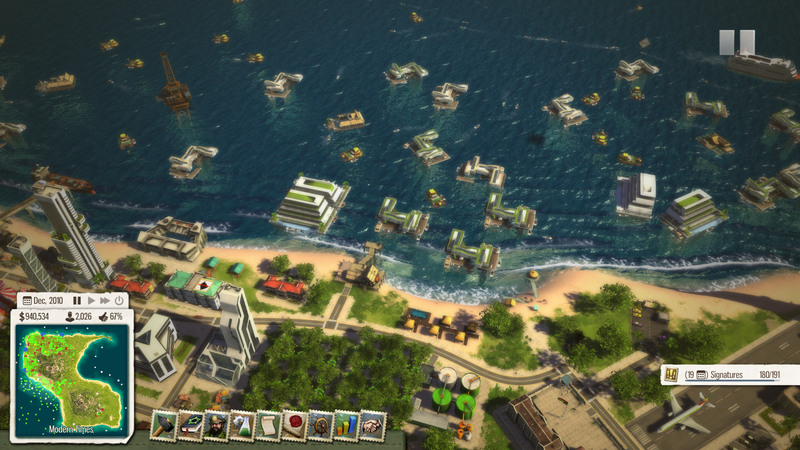 Addition Waterborne for the game Tropico 5 includes a variety of improvements and additions to the gameplay, including water traffic, huge coastal areas and new exciting events. A completely new campaign, which includes six epic scenarios, new dialogues and a story telling about the marine life in Tropico. Meet the favorite characters of Tropico and again enjoy unusual adventures, incredible rework and branded political humor. - Go to the """"Games"""" and select """"Activate via Steam""""